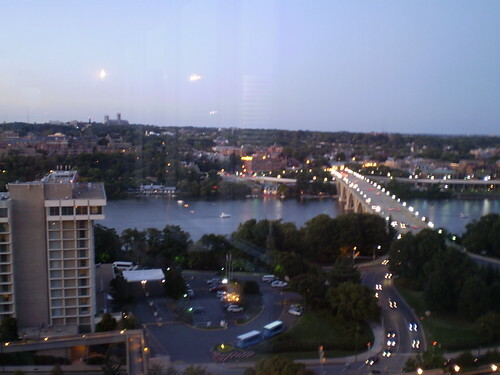 A long time ago, maybe even in another life, I lived and worked in the bustling region known as Northern Virginia. Back then it wasn't quite so bustling; it still amazes me to hear traffic reports that include the far reaches of Gainesville and occasionally even mention Haymarket. As for Chantilly, one of my coworkers used to talk about it as her country home town. Still, it's exciting to be able to travel into the cities, especially with someone who helps out to look after all the complications of getting around. On behalf of Patrick County, then, as volunteers, Charlotte and I traveled up the Shenandoah Valley to attend the annual tourism conference, also known as the VA-1 conference. We were invited to stay with my SO's sister, Kate, in Annandale, not far from the conference site in Alexandria. Kate went out of her way as our hostess and transportation director throughout the entire weekend. When we had a free moment (not many of those) she fed us tea and lovely little snacks (with some kick; watch those brownies). Charlotte wanted to meet with her granddaughter, Sadie, on Sunday so Kate found a terrific restaurant for us all and turned the dinner into an experience. I wanted to visit with cousin Jane, too, but she was suffering from flu shot induced plague and we had to miss out! 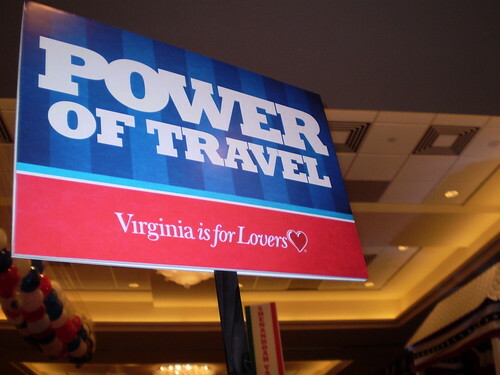 The theme of the conference was basically about tourism as a large part of the Virginia economy. Everyone admitted that things have been difficult lately but the tone was upbeat and hopeful. Charlotte and I went up early so we could take a couple of pre-conference seminars. We had to navigate the Metro and after some help from some very nice people, we figured it all out and managed to get to the Alexandria Hilton on time. If I lived up here now I'd love the Metro, at least the times we were on it. Not nearly the crowds I expected. The second day was mostly speeches and a ton of great information. Virginia now ranks 8th in the US for domestic visitor spending. Not bad, especially considering the current economy. TOURISM WORKS FOR VIRGINIA!!!! We ate great! And not so expensively. Vantage Point on Sunday was a nice restaurant and we enjoyed the view, the company and the food. It's always great hearing about Charlotte's lovely and talented granddaughters and it was fun to see Sadie after so many years. She and her friend Tiffany are having a wonderful adventure working in the area. On Monday evening we attended the conference opening and reception at the Masonic Memorial in Alexandria. I didn't get pictures because we had a full day's work and I didn't bring the camera, but it is a lovely building. The reception room was deafening, though, with a couple hundred tourism folks all trying to talk. I kept slipping out to look at the marvelous prints of all the Masonic buildings in the country. Not much networking there! I did get a chance to talk to some great people, though, outside the reception room. After things wound down Charlotte and I went out to stand on the steps and look at the city. Lovely to see in the twilight. The food was good at the reception and of course Kate had to feed us when we got home, despite our protests that we were fine. Just a little something was what she said. Then on Tuesday there was food all day at the conference (even cookies) and dinner with Kate and Gerry in the evening. This was our chance to really have a good talk, since the rest of the time was pretty much all about work and tourism. It was lovely sitting in Kate's cozy English cottage in the middle of Annandale! I went home with stacks of clothes and blazers from Kate's closet, including a gorgeous new coat! On Wednesday we got up late and headed slowly for home, with an eye toward quilt shops and local yarn shops along the way. We tried to get to a quilt shop in Haymarket but there was a construction mess and I got in the wrong lane. Traffic was backed up half a mile in the direction I wanted to travel when we crossed the intersection so I just kept going. We made a couple of stops in Sperryville, Virginia. Charlotte wanted peaches and we saw a sign on the way up. The farmers market was also an antique shop and they carried Nancy's Fudge candies. I mentioned that I was from Meadows of Dan, where Nancy's is made, and managed to sell ten of her hot chocolate spoons to a customer! I picked up a few Empire apples because they look like dusky Macintosh. Our next stop was the Beech Spring Farm Stores. I wanted to show Charlotte their lovely quilts but I fell in love with the little spinner in the picture above. And since I do so many demonstrations, I thought the handled basket from the same shop would be great to carry carded wool. Once we were out in the country, though, we found our way easily to Rachel's in Staunton. Charlotte is the quilter but I admired the lovely fabrics (and the store cat) in the unique shop. The old railway depot served to house the shop and the Depot Grill, where we had a great lunch. Then it was my turn to shop, although Charlotte, who is also a weaver, did her part. We traveled off the beaten path a bit out beyond Raphine, Virginia, to a delightful LYS beside a beautiful stream along a rural road. 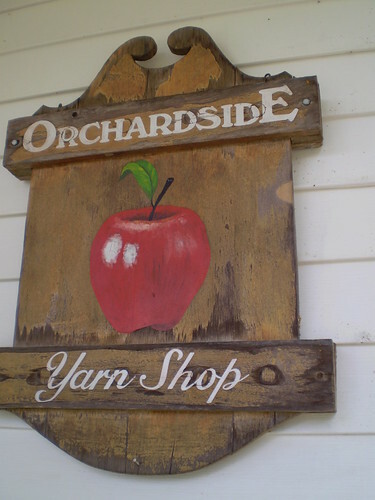 Orchardside Yarn Shop has a lovely atmosphere, a wonderful selection of yarns and friendly people! And shop dogs...what more could you ask? And who wouldn't love a yarn shop with a bottle of wine sitting in the middle of the table? It was tough to decide what to buy, as I already have plenty of yarn. I hovered over the lovely colors of yarn brands I recognized, then I saw one that was new to me. 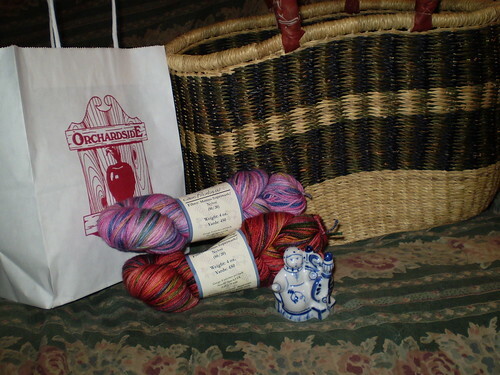 The two skeins in my "purchases" picture are labeled Pagewood Farm, Hand Dyed Sock Yarn, Denali. The two colorways I chose were Chuck's Favorite and Rainbow. This is a soft superwash merino/nylon blend. I'm looking forward to seeing how it knits up. Probably won't be socks, though. Even though this isn't a local product (it's dyed in California) it has a small company attitude I like. 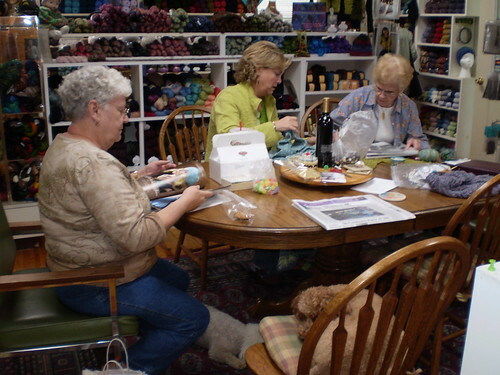 I can certainly recommend taking the time if you're traveling up or down I-81 to stop at Exit 205 and head west through Raphine to Orchardside Yarn Shop. It's easy to find because there were signs all along the way to encourage you to keep going. Just slow down past Wade's Mill and you'll see the sign on the right. I saw some lovely sights and met some wonderful people but coming home to these happy faces was the highlight of the week. 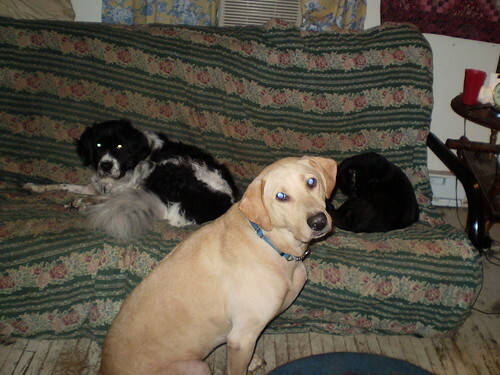 It was nice to settle in with the dogs and the cat for a quiet evening of knitting after an interesting week. Now I'm glad to be back at my little shop here in Meadows of Dan and looking forward to a busy October!